Would you like to advertise on DStv? DStv provides a broad spectrum of entertainment and information. DStv works on the awareness that we are all individuals and that no two people are alike. DStv advertising offers customers various bouquets to suit their needs and their pockets. Our passionate team of tv producers will ensure that you get the best quality and research for your advertising budget. Your television commercial does not have to cost an arm and a leg... With 19 years experience, we know how to conceptualize your TV advert with your budget in mind. We have put together very affordable ad packages that will introduce your company or product to the market in a straight forward, effective way. Contact us for a meeting so we can discuss your needs. How The Television Campaign Building Process Works? There are two major parts to building a television campaign: your ad and your media plan. We’ll take you step by step through the process of building each half of your campaign—you can even give it a try to find out what your ad could look like, or what areas you should advertise in around your business. We’ll help you determine the right type of ad for your business, as well as the most cost-effective way to build it. We have multiple creative options to suit nearly any budget. You can customize one of our pre-styled ads for your needs, or have us create a Custom series ad from the ground up. 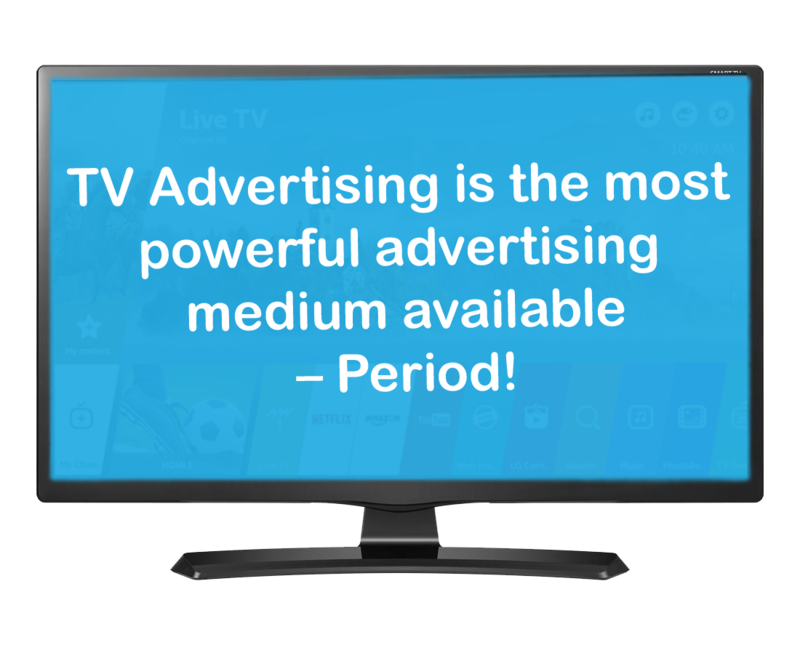 Your media plan is the airtime schedule of programs, days, and times where your ad appears on television. The best media plan takes into account your budget, your goals—whether you need brand awareness, or want to promote an event, and your customers. The landscape of television has changed dramatically over the last 20 years & as a result, so has television advertising. DStv now captures more than 90% of the LSM 9-10 television viewers in South Africa, and viewership is increasing every year. Using DStv, you can put your business on television cost-effectively by airing on channels with smaller viewership but still appearing on the same networks as major brands. Maximize your budget by advertising on just the channels that your market watches with the highest possible hit rates. DStv has given rise to “niche“ advertising on television, allowing you to target your customers precisely. For the first time, you can put your business on individual channels like BBC Food, The Discovery Channel, or KykNet to advertise to specific consumers you want to reach with interest in the products or services you’re selling. What We Do For You & How Costing Is Calculated Per Advert? Assistance with initial market research to determine your advertising needs. Guidance through the conceptualization and production of you television commercial. Taking care of buying the media plan, sending your ad to the networks, and monitoring your campaign. Assisting with the development of a website in order to determine a measurable indication of the numbers of hits on the website. The cost of television advertising is like buying a car - it all depends on your requirements. Do you want to do a “Call to action” campaign or a branding exercise? How long do you want the campaign to run for? What is your primary and secondary objectives with the campaign? We will assist you every step of the way to determine which DStv channels are best suited for your target audience. Okay, But What Can I Expect To Get? A good branding campaign can be achieved for as little as R192,500*. With this budget, you will receive up to 170 spots spread across sports, lifestyle, documentary and entertainment channels. This price is based on a 30-second advert and 60% of your spots will be guaranteed prime time over a period of 2 weeks. There are obviously a lot more options to choose from. Why don’t you CONTACT US to set up a meeting to discuss your advertising needs. The total price is excluding VAT and production, but includes admin fee.